Cobblers have made their first signing of transfer deadline day by landing Scunthorpe United central defender Charlie Goode on loan until the end of the season. The 23-year-old was a regular in the Iron rearguard in the first half of the Sky Bet League One campaign, making 25 appearances, but hasn't played since starting in the 2-0 win at Peterborough United on New Year's Day. Goode began his career at Fulham, but was released as a 15-year-old and went on to play non-League football with AFC Hayes and Hendon, before winning a contract at Glanford Park in the summer of 2015. In all, the Watford-born Goode has made 70 starts for Scunthorpe club as well as 15 substitute appearances, scoring six goals, with three of them coming this season. 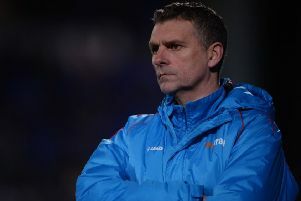 "I felt we needed to add a central defender," said Cobblers boss Keith Curle. "I met Charlie on Wednesday, and we feel this is a good move for both parties. "He has a lot of EFL experience, he is a right footed central defender and I think he will come in and help improve us. "He is a dominant defender who can play on the right side in a two or in a three or in the middle of a three and he has a good range of passing. "He is a threat in both boxes and we are pleased to have secured his signature when there were a number of clubs interested in taking him." Goode is available to make his Cobblers debut in Saturday's league two clash with Colchester United at the PTS Academy Stadium. He becomes the fourth loan signing Curle has made in the January window, along with George Cox, Joe Powell and Timi Elsnik. Curle has yet to make a permanent signing.